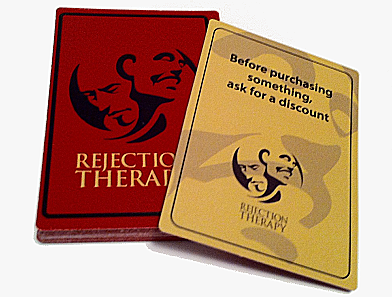 Rejection Therapy by Jason Comely is a game with one rule: you must get rejected, in real life, at least once a day, every day. The point: you will find yourself rejected less frequently than you believed, you will be fulfilling your potential (for asking for things, at least), and you will be less fearful of rejection. The cards (it’s actually more of an RPG or ARG) are published by the Game Crafter.